This beautiful medal, patterned after the famous "Footprints" poem, is crafted from sterling silver. The medal depicts a cross on the left side, and footprints on the right side. 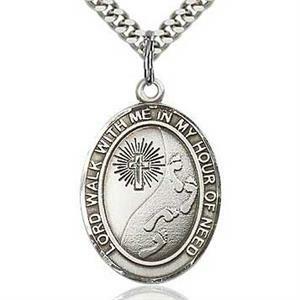 This image is encircled with the words, "Lord, walk with me in my hour of need." A beautiful gift for someone who may be experiencing struggles or difficulties. "One night I dreamed a dream. The Footprints in the Sand Medal arrived just as ordered... even better than I had hoped. My girlfriend loved it. She loves everything relating to the "Foot Prints in the Sand". This really made her smile and blessed that such a medal exists. It was the perfect gift for a special occasion. The speed in which I received it was tremendous as it was an emergency situation that your company had no idea existed. Thank you I will purchase from you again. The website was very easy to navigate.